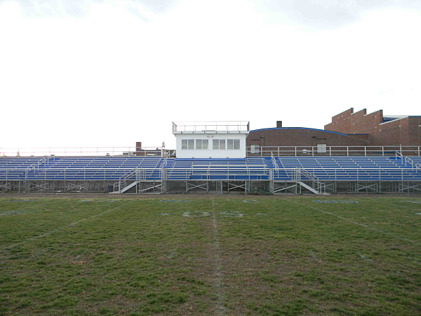 Accommodating crowds from just a few hundred spectators to more than 10,000, the configurable steel and aluminum I-Beam Grandstand bleacher seating can be built anywhere, for any sport. It is designed to be permanently anchored to reinforced concrete columns or piers. The seat planks have a clear, anodized finish. Footboard planks are mill finished. The understructure of this seating system consists of welded steel beams, stringers, and braces, made from extruded aluminum. The components used in the I-Beam understructure go through a galvanized process which means they are "hot-dipped" in a molten bath of zinc which coats the steel with a thin layer of protection against rust and corrosion. The understructure offers more versatility for a variety of uses from restrooms and concession stands to storage, dressing facilities, walkways, and more. This steel-framed structure offers the ideal combination of safety, aesthetics, functionality, and affordability for a wide variation of facilities from high school and collegiate sports to entertainment venues and much more. 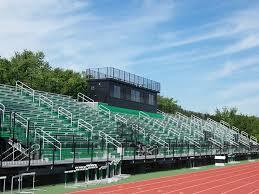 Contact Toadvine today if you would like a quote or want to learn more about the I-Beam Grandstand bleacher. What are Loge Boxes and Why do You Need Them? Loge boxes are areas of private seating that typically have an open space for mobile seating like folding chairs, but are bordered by railing. They give the spectator a more flexible viewing experience along with a little more privacy during the event. They also have the conveniences of drink rails, defined private spaces, and can be customized to your objectives. If you are a high school or collegiate sports program, you may wonder why you need something like this. Here are just a few examples of why loge boxes can really help your program. If you have faculty that you want to honor during events or during athletic matches, a loge box makes great sense for you. A loge box can be used at every event as a way to honor teachers, donors, sponsors, faculty, visiting governing officials, returning alumni, and others. 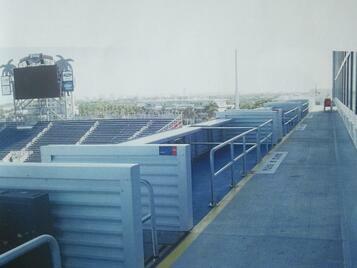 If you have luxury suites you can use loge boxes as the middle option and as a way to increase your revenue. If there are people reserving the luxury suites there will be a portion of spectators who would find loge boxes to be the price point that they are comfortable with and would be excited to reserve their own box for the season. If a business reserves the box you can suggest ad placement there in addition to or included in the price. If your program is not at the point of having spectators open to the amenities of a luxury suite, loge boxes can become your high end offering to sponsors and spectators willing to spend a little more on their sports experience. Loge boxes do not have to be much different than the standard club seating. They can be different enough to fill them, but not too different that they don't fit into the environment of your overall facility. Contact Toadvine Enterprises today with your questions and let us walk you through the benefits of loge boxes for your program. We look forward to your call.